Our 100% locally owned auto repair shop in Saskatoon provides several services related to automotive transmissions. When there’s a problem with your transmission or you know it’s due for maintenance to avoid major repairs, Extreme Transmission Rebuilders will service any transmission in imported or domestic cars. If your car is hesitating to accelerate, slipping gears when shifting, or is making a clunking noise while shifting, it may be the transmission, so bring your car in for repairs. We will change the oil and filter to keep everything clean and running smoothly. We also rebuild transmission for any model car. Electronics play a large part in the transmission’s operation, and if you’ve experienced transmission failure, it may be due to a wiring, sensor, solenoid problem, or computer failure. Our mechanics work with standard and automatic transmissions to repair internal damage, restore the integrity of each part, and save you from replacing the car in the near future. We repair and service differentials in all makes and models. Differential repair is a complex repair- the guys at Extreme have 25 plus years of experience in this area. Have a hot rod and want to change the gear ratio? We can help pick the exact ratio for your application. Transfer cases are an integral part of trucks and SUVs-these units are now more complex than ever. Tire sizes from front to rear are more important than ever to prevent damage to these units. The boys at Extreme work on all these units on a daily basis. Transmission failure can be caused by contamination; when even the smallest contaminants not removed by the filter find their way to the internal components. The cooler most often collects these contaminants, which can result in the need for a radiator (or cooler) replacement. A restricted cooler can cause transmission overheating and restrict the amount of lube oil to the planetaries causing failure. 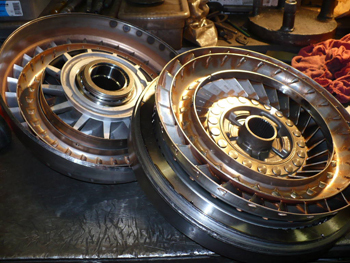 We replace clutches on all units from stock to high performance units. Just give us a call. Torque converters are more complex than they used to be from high stall to triple disk converters-extreme can help-just give us a call. Have a diesel truck and pull big loads? No problem- the guys at extreme have years of experience in this area. We do not have a one trans fits all approach. Give us a call with your particular scenario, engine mods, type and weight of load, and we will come up with a package that fits your needs. From shift kits to triple disc billet torques, billet shafts and servos, alto clutch packs and more. We stock most of these components to get you on the road fast. If you have a standard transmission we can upgrade your clutch to a much heavier unit. If you have a hot rod and want to make it more drivable, maybe an overdrive is for you. Extreme transmission has been retrofitting automatic overdrives for many years. Bring your engine RPM down to fewer than 2,000 RPM on the highway and boost your fuel mileage- there are many options. So call the guys at Extreme with your project so they can come up with the best combination for you. Rear end rations are also very important-we can calculate the exact RPM you want to be at a given speed. Just give us a call-we would be more than happy to help you with your hot rod. We have the tools knowledge and supplies to repair and replace any gear box. Whenever possible we will strip the faulty gear box and make repairs rather than replacing the entire unit to save you time and money.